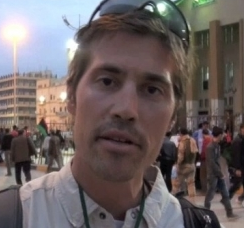 BOSTON -- GlobalPost correspondent James Foley called his mother at her home in New Hampshire on Saturday in the first contact he has been allowed to make since forces loyal to Libyan leader Muammar Qaddafi first detained him on April 5. Foley told his mother that he was fine, that he felt strong and was not injured. He told her not to worry, that he was eating and drinking and had a decent bed, a blanket and a pillow. He stressed that he was being treated well and expressed his gratitude to the Libyan people. Foley's mother, Diane Foley, said she felt tremendously relieved after receiving the call at about 3 p.m. on Saturday. Foley was first captured while reporting on the outskirts of Brega, a key oil town in eastern Libya that has seen some of the heaviest fighting between Qaddafi forces and the Libyan rebels since the conflict began. Foley, 37, was detained along with Clare Morgana Gillis, a freelance journalist who wrote for The Atlantic and USA Today, and Manuel Varela, 30, a Spanish photographer who works under the name Manu Brabo. Foley had been reporting on the rebel army and their movements for GlobalPost since the middle of March. Foley told his mother that he was in a Tripoli detention center together with Brabo. Foley, a fluent Spanish speaker, said the two spoke often. Foley told his mother that he had also grown close to Gillis but that she had been transferred to another facility. The Spanish news agency that Brabo had been working for reported that he also had been allowed to make a phone call home. Although Foley said he had not seen the South African photographer Anton Hammerl, who went missing at the same time, the South African government said it had received information from the Libyan authorities confirming that Hammerl is in good condition and would be released soon. On Thursday, Gillis was also given the chance to call her parents from Tripoli. In that phone call, Gillis told her parents, Jane and Robert, that she had been with Foley and Brabo until Tuesday, when she was moved to a women's facility. Gillis' parents said that their daughter sounded upbeat. But they remained concerned that she had yet to be released. At a press conference on Thursday, U.S. Secretary of State Hillary Clinton demanded the release of all U.S. citizens who have been "unjustly" detained inside Libya. Eyewitnesses first saw Foley and Gillis taken by Qaddafi forces outside the eastern city of Brega on April 5. But the Libyan government had previously not officially confirmed it was holding the two reporters and had not allowed them visitors or let them make phone calls. For more than two weeks Libyan officials have given conflicting reports about the whereabouts and well-being of the reporters. Before the calls home, the only evidence of their location came from another journalist who reported from Tripoli that he had spotted them inside a detention center in the capital on April 7. Whether that detention center was being run by the government, the military or the country's intelligence services was unclear. That source said at the time that both Foley and Gillis appeared to be in good condition. As their children's detention drags on, the families of Foley and Gillis have stepped up media campaigns that they hope will help speed their release. Last weekend, Foley's friends and family held a vigil where they appealed directly to the Libyan government for its help. "We love our son very much and we want and need him to be back safely here in New Hampshire," said his father, John Foley, during a press conference at the Foley home. "We are so grateful to all those in this country and around the world who have worked for James' freedom and that of his fellow journalists. We are praying for you, son, and for your swift return home." Human Rights Watch has urged the Libyan government to release or at least provide information about all of the 15 journalists it believes are being detained inside the country. "Libyan and foreign journalists are facing unlawful restrictions from the government, including incommunicado detention in Tripoli," said Peter Bouckaert, emergencies director at Human Rights Watch. "If the government has nothing to hide, then it should let the media do its work." Human Rights Watch said that nine foreign journalists and six Libyan journalists are now detained or missing in Libya. GlobalPost continues to work all the necessary and appropriate channels to secure the safe release of Foley and Gillis. GlobalPost remains in close touch with The Atlantic, USA Today, the State Department, the Turkish government and other organizations that may influence a positive outcome. Turkey is one of the few countries still operating an embassy in Tripoli and has helped free a number of other journalists detained there, including four New York Times reporters captured last month. "We deeply appreciate the very important behind-the-scenes work being carried out by the Turkish Foreign Ministry and its staff who are negotiating with the Libyan authorities to secure the release of our journalists," said GlobalPost President and CEO Philip S. Balboni.